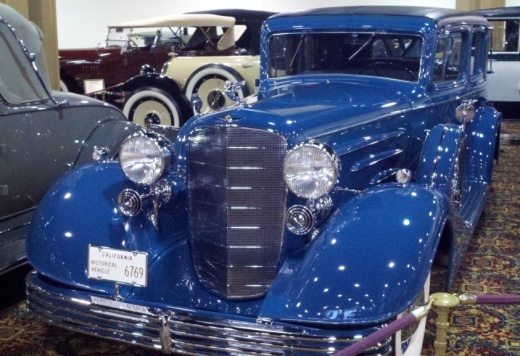 The Nethercutt Museum in Sylmar houses a spectacular collection of over 120 antique, vintage, black iron and classic automobiles. This is a place that a surprisingly few number people know about but is a MUST SEE (another "hidden gem," like The Mullin Automotive Museum in Oxnard). It is a truly gorgeous collection of cars, including numerous winners of the Pebble Beach Concours d’Elegance and other famed auto shows. Particularly eye opening to an auto novice like me is the sheer number of different car manufacturers on display that I'd never heard of, like Tucker, Simplex, Cord, REO, Maybah, Ruxton, Westinghouse, Pierce-Arrow, Moon etc as well as autos made by Daimler, Rolls Royce, Cadillac, Packard, Lincoln, Ford, Duesenberg, Oldsmobile, Bugatti and others. There is also huge number of hood ornaments, headlamps and other vintage paraphernalia on display. Admission to The Nethercutt Museum is FREE of charge and hours are 9 a.m. to 4:30 p.m. Tuesday through Saturday. Closed Sunday, Monday and all major holidays. Visit www.nethercuttcollection.org for more information. Open to all ages. Located at 15151 Bledsoe Steet, Sylmar. When I went I took the 101 east to the 405 south towards Santa Clarita, which becomes the 5 freeway. Get off at Roxford exit east (exit 159A; don't get confused and take the NEXT Roxford exit). Turn right on Roxford, right on San Fernando Road and left on Bledsoe. Museum is a few blocks up on the left hand side. Turn left on Bradley (at Bledsoe) and an immediate left into the parking lot. 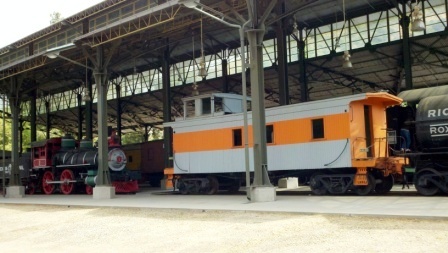 Outside the Museum you can walk through a 1912 Pullman Rail Car and a 1937 Canadian Pacific Royal Hudson Locomotive. Open twice a day (weather permitting) at 12:30 p.m. and 3:45 p.m. for 15 minutes. In addition to the main Museum, next door at 15200 Bledsoe is The Nethercutt Collection, which has over 50 automobiles along with what they call the world's finest assemblage of mechanical musical instruments. Admission here is also free but you must make reservations for the 2 hour docent-led tour, kids must be 12 and older, and no video recording or flash photography is allowed. Tours are currently offered at 10 a.m. and 1:30 p.m. Thursday through Saturday. We love driving down to Will Rogers State Beach from time to time, bring the bikes and enjoy the Marvin Braude Coastal Bicycle Path along the Pacific Ocean. This fun 22 mile path takes you from Pacific Palisades as far as Torrance. Depending on how far you want to go and if you have kids with you, there are so many spots to stop along the way. To get to Will Rogers State Beach from the Conejo Valley, take the 101 to Las Virgenes/Malibu Canyon Road south to PCH, then about 9 miles down PCH to Will Rogers (17000 PCH), just east of Gladstones and Sunset Boulevard. Parking at Will Rogers varies based on when you go; I last recall paying $10. The path doesn't actually start at Will Rogers Beach as it is a walking path only at this point. Ride the bike through the parking lot to the start of the bike path at Temescal Canyon Road. And, you're off! With younger kids, the Santa Monica Pier makes a perfect 6 1/2 mile round trip destination as you can stop, eat lunch and have some fun at Pacific Park, then ride back. Or kick it a few notches and ride to/through Venice Beach for all the action. There are plenty of restrooms water stops and of course non-stop BEACH to enjoy here, making this one of my favorite destination for bicycling with the family. And of course, you don't have to park at Will Rogers...you can park anywhere on PCH in and around the bike path to enjoy it. Of course you do have to be careful of sand on the path, pedestrians/beach goers crossing and walking on the path, other cyclists, runners, roller bladers and crowds. CLICK HERE FOR DOZENS OF FAMILY-FRIENDLY BIKE PATHS BACK UP IN THE VENTURA COUNTY AREA! 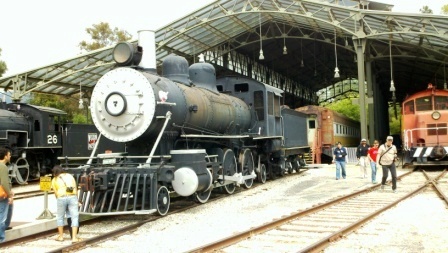 The Griffith Park & Southern Railroad has operated almost continuously since 1948. GP&S Railroad, 4400 Crystal Springs Drive, Los Angeles (near Los Feliz and Riverside) and Travel Town Railroad, 5200 Zoo Drive, Los Angeles, Forest Lawn exit from the 134 Fwy.) are open 364 days a year, closing only on Christmas Day. If your kids are Thomas the Tank Engine fans, then this is a no-brainer half day excursion. We visited GP&S over a Memorial Day weekend and the kids could not get enough of the 1 mile mini-train ride, traveling over 2 bridges, a tunnel and a mini-Western town. Travel Town is a 3/8ths of a mile track that does 2 loops, so you do get 1/4 of a mile more ride for your money on the GP&S track. Both rides are $2.75 per person as of March 2018 ($2.25 for seniors over age 65). GP&S also has a simulator ride, pony rides and concession stands. 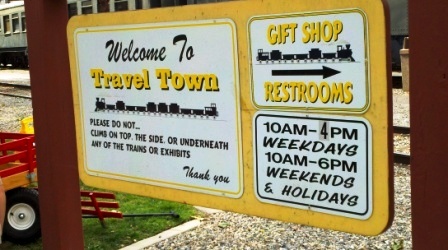 Travel Town also has a railroad equipment history museum as well as dozens of old-time railroad locomotive and cars. For more information, visit www.gprah.com or call 323.664.6903 (GP&S) or 323.662.9678. Pics and vid from a trip to Travel Town in April 2011. Founded in 1916, the Santa Barbara Museum of Natural History is a very low key museum that makes for a great excursion to Santa Barbara with the kids. 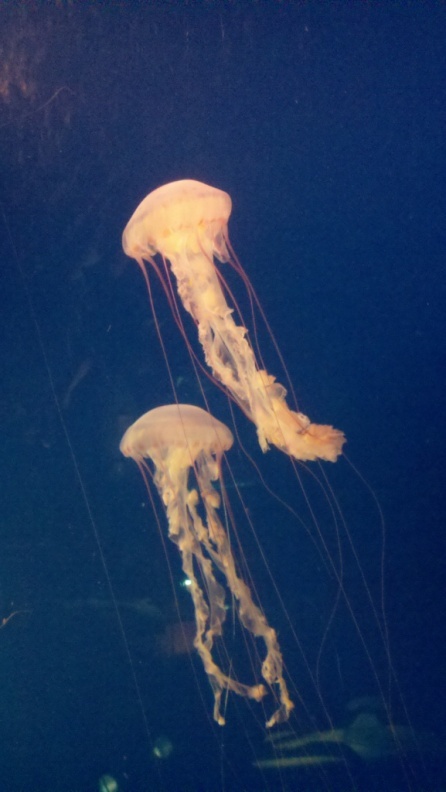 There are eight exhibit halls with permanent exhibits featuring birds, mammals, insects, ocean life, a planetarium and more. Many of the exhibits are "hands on" with buttons and interactive features that kids particularly enjoy. There are an additional two halls for changing exhibits. You and your kids can roam the nature paths and visit the well stocked gift shop, full of educational items. I can vouch for the fascination kids (and adults) have at this Museum. It is a very comfortable museum that in my experience is rarely is crowded. The "Museum Backyard" area and gardens has a picnic area, stream, "Dino Dig," and other enjoyable features. The pond and stream often have tadpoles that captivate the kids. The museum is open 7 days a week and is closed certain holidays. As of September 2017, admission is $12 for adults, $8 for 65+ seniors and teens (13-17) and $7 for children 2 to 12 years of age. Become a Museum member and you don't have to pay for admission. The Museum also offers birthday parties for members. Family memberships are currently $85/year. Free Family Sundays are on on the third Sunday of January, February, March, April, September, October, November and December. No free days in May, June, July and August. Also in the "Backyard" area of the Museum, there is a physical structure managed by the Santa Barbara Audubon Aviary that cares for birds of prey that are no longer able to survive in the wild. Often volunteers will bring these birds out for visitors to admire. These birds are beautiful. Santa Barbara Museum of Natural History is located at 2559 Puesta del Sol Road, Santa Barbara. More information at www.sbnature.org or 805.682.4711. The "Backyard" area of the Museum makes for a peaceful, rustic wedding/party venue. 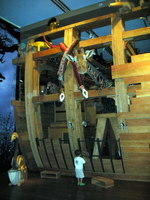 Noah's Ark at the Skirball is a can't miss excursion for your kids. It is an 8,000 square foot permanent exhibit with a huge ark and numerous interactive exhibits involving the various animals on the ark. While roughly based on the biblical story of Noah's Ark, the exhibit is nondenominational and is an interactive learning and fun experience. I would say that generally kids between the ages of 2 and 7 will enjoy this exhibit the most but kids and adults of all ages enjoy this amazing display of life-size giraffes, camels and uniquely displays. If you plan to attend, reserve a space in advance as they limit the crowds to manageable quantities (which is good because it gives the kids more space to explore). This is a beautiful museum off the 405 freeway going down the Sepulveda Pass, off at Skirball Center Drive, roughly 25 miles from Thousand Oaks. The Skirball is open Tuesday through Sunday (closed Mondays and certain holidays). Museum admission is $12. $9 for 65+, full-time students with ID and children over 12. $7 for ages 2-12. FREE admission to all on Thursdays. 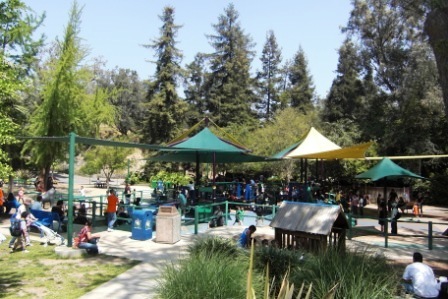 The 133 acre Los Angeles Zoo and Botanical Gardens first opened in 1966. The Zoo is home to more than 1,100 mammals, birds, amphibians and reptiles representing more than 250 different species of which 29 are endangered. In addition, the Zoo’s botanical collection comprises several planted gardens and over 800 different plant species with over 7,400 individual plants. The Zoo receives over 1.5 million visitors per year and is owned and operated by the City of Los Angeles. There's a children's zoo area with a petting zoo and fun exhibits. There's also a play area for kids that is quite popular. Some advice! The line to get into the park can get pretty long on weekends. My advice is to buy an L.A. Zoo Membership! There is a $134 one-year family membership (as of June 2016) that gives you FREE admission for 2 adults and all of your kids, plus 2 one-time guest passes. If you have a family of 4 and visit the park twice a year, this membership SAVES YOU MONEY as the regular entry cost is $20 for adults and $15 for ages 2 to 17. Ages 62+ is $17. (Pricing as of June 2016.) Plus, there was NO LINE to get in with your membership card! That alone gave us an extra 30 minutes in the park today. Lastly, the card gives you 10% off your meals and gift shop purchases. Seems like a no brainer! Zoo membership also gives you free or discounted admission to zoos and aquariums across the country. 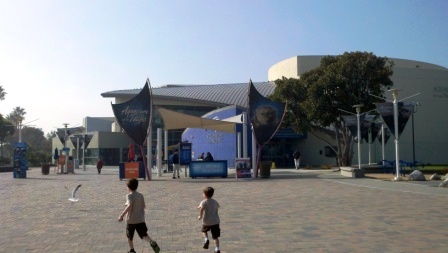 The Living Amphibians, Invertebrates, Reptiles (LAIR) exhibit opened in March 2012. There is a damp forest section that has Fiji Island banded iguanas, poison dart frogs, Guatemalan palm vipers and Fly River turtles, an area where you can watch staff taking care of the animals, tortoises, lizards, crocodile swamp, desert reptiles and much more. We also learned that Mexico has more reptile species than any other country on earth. The L.A. Zoo is located at 5333 Zoo Drive, Los Angeles. 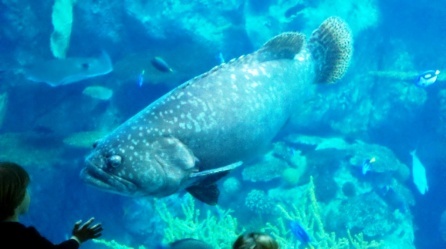 Visit www.lazoo.org or call 323.644.4200 for more information. The La Brea Tar Pits has the largest collection of Ice Age plants and animal fossils in the world. Over the last 100 years, more than 3 million bones, plants, bugs and other items have been retrieved from the oily asphalt that continues to ooze up out of the ground at Rancho La Brea in the heart of Los Angeles. These bones are between 10,000 to 40,000 years old. The Page Museum located at the La Brea Tar Pits displays many of these bones...giant mammoths, saber tooth cats, ground sloths, bears, wolves, bison and a whole assortment of animals. The museum is open 361 days per year from 9:30am to 5pm, closed only for Independence Day, Christmas Day, Thanksgiving Day and New Year's Day. We visited on a Sunday and were amazed by the fact that half a dozen scientists were hard at work in this amazing "fish bowl" laboratory, cleaning and restoring fossils while we watched. Outside, you can walk around and see the gooey sticky tar-like asphalt, including "Pit 91," where the annual excavation of Ice Age fossils has taken place since 1969. 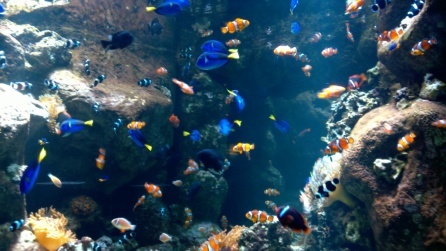 This is a great place to take the kids, for both education and for a fun, active excursion. Page Museum at the La Brea Tar Pits is located at 5801 Wilshire Boulevard, Los Angeles 323.934.PAGE (7243) Visit www.tarpits.org for more information.